The public makes sharp distinctions about which groups have benefited – and which have not – from the economic policies the government has put in place since the start of the recession. Majorities say that large banks, large corporations and the wealthy have been helped a great deal or a fair amount by government policies. By contrast, 72% say that, in general, the government’s policies since the recession have done little or nothing to help middle class people, and nearly as many say they have provided little or no help for small businesses (68%) and the poor (65%). These opinions have changed little in recent years, and differ only modestly across demographic and income categories. There are significant partisan differences in these views, though majorities of Democrats, Republicans and independents say that government policies following the start of the recession have done little or nothing for the poor and the middle class. 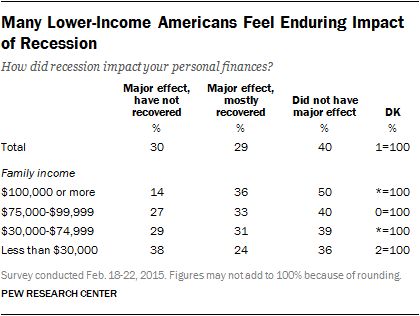 When asked about the impact of the recession on their personal finances, 29% say the recession had a major impact on their finances and their finances have mostly recovered; about as many (30%) say it had a major impact and their finances have not recovered. Four-in-ten say the recession did not have a major effect on their finances. The share saying their finances have not recovered from the recession has declined slightly, from 36% in 2011 and 33% in 2013 to 30% currently. Those with lower family incomes are especially likely to say they are still recovering from the recession, six years after it ended. Among those with family incomes of less than $30,000, 24% say the recession had a major impact and their finances have mostly recovered, while many more (38%) say it had a major impact but they have yet to recover. 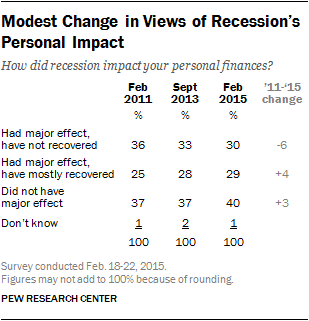 Just 36% say the recession did not have a major effect on them. By contrast, people with family incomes of $100,000 or more were less affected by the recession; half (50%) say the recession did not have a major impact on their finances, the highest percentage of any income category. And among those affected by the recession, far more say their finances have mostly recovered (36%) than say they have not yet recovered (14%). Economic System Still Seen at Risk. Most Americans continue to think the U.S. economic system is still vulnerable to the type of crisis that devastated the economy in the fall of 2008. Currently, 63% say the economic system is no more secure today than it was before the 2008 financial crisis, while only about a third of Americans (34%) say it is more secure. These attitudes are virtually unchanged from two years ago. Views of National Economy Weaken a Bit. About a quarter (26%) view economic conditions as excellent or good, about the same as in January (27%). But “poor” ratings of the economy, which fell nine points from October to January, have increased seven points since last month. Most Say Economic System Favors Powerful Interests. Currently, 62% say the economic system in this country unfairly favors powerful interests, while only about half as many (33%) think the system is fair to most Americans. This opinion is little changed since last year. The view that the economic system is tilted toward the powerful is shared by those in all income categories. 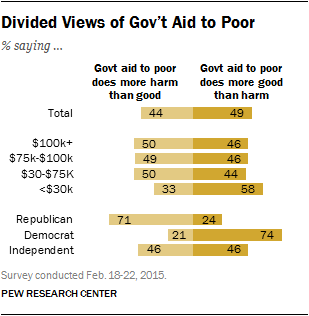 Stark Partisan Divide over Government Aid to Poor. About half of the public (49%) says government aid to the poor does more good than harm, because people are unable to escape poverty until basic needs are met. Nearly as many (44%) say government aid to the poor does more harm than good, by making people dependent on the government. There is a stark partisan divide in these attitudes: 74% of Democrats say government assistance to the poor, on balance, does more good than harm; 71% of Republicans say it does more harm than good. Majorities across virtually all demographic and partisan groups say wealthy people have been helped a great deal or a fair amount by government policies since the recession began. Substantially smaller shares say middle class people and poor people have benefitted at least a fair amount. Still, there are partisan differences in these opinions: Republicans (55%) are less likely than Democrats (73%) to say the wealthy have benefitted at least a fair amount from government policies since the start of the recession. Republicans also are less likely to say that the middle class has been helped: Just 16% say the middle class have been helped at least a fair amount, compared with 36% of Democrats. Comparable shares of Republicans (38%) and Democrats (34%) say poor people have been helped a great deal or fair amount by government policies. Majorities of those in all income groups say that government policies implemented since the start of the recession have helped the wealthy. At the same time, relatively small percentages across income levels say government policies have done at least a fair amount for either the poor or middle class. Two-thirds (67%) say the government’s policies have benefitted large corporations. 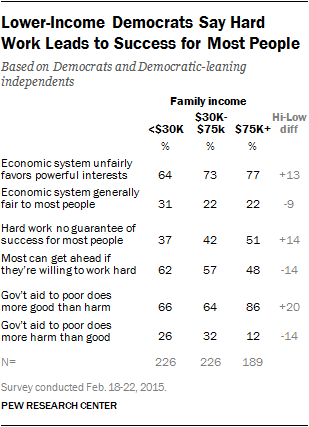 These views also vary only modestly across different income and partisan groups. 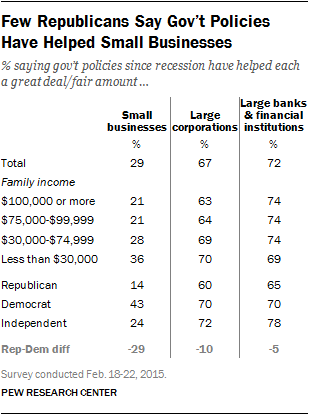 There are larger partisan differences in views of what government policies have done to help small businesses since the beginning of the recession. About three times as many Democrats (43%) as Republicans (14%) say these policies have helped small businesses at least a fair amount. Since September 2013, there has been an across-the-board rise in the view that the job situation has at least partially recovered from the recession. However, most say that jobs have partially (60%), rather than fully (7%), recovered. 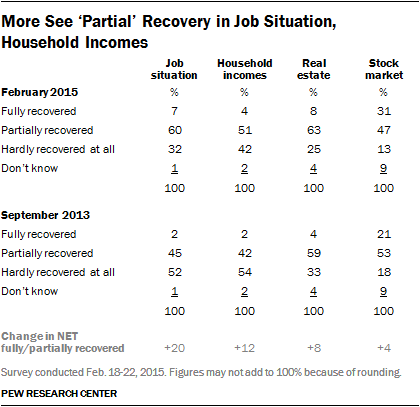 Republicans, Democrats and independents, and those across income levels, are all much more likely to see a stronger recovery in the job situation than in September 2013. 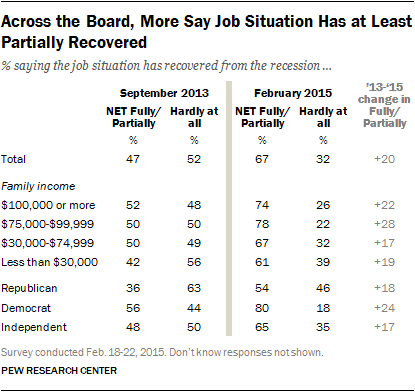 Still, far more Democrats (80%) than Republicans (54%) see a recovery in jobs. A similar pattern is evident in whether household incomes have recovered since the start of the recession. 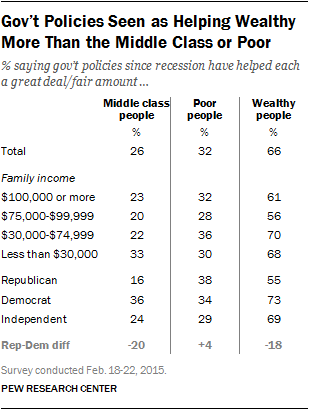 And there continues to be a sizable gap in these perceptions both by family income and partisanship. Half (50%) of those with incomes of $30,000 or less say that household incomes have recovered fully or partially, while nearly as many (48%) say they have recovered “hardly at all.” Majorities in higher income groups see at least a partial recovery in household incomes. 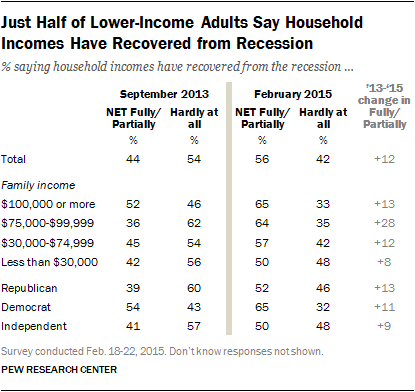 Nearly two-thirds of Democrats (65%) say household incomes have seen some recovery from the recession, compared with only about half of Republicans (52%) and independents (50%). Overall, 26% describe economic conditions in the country as excellent or good, while slightly more (31%) say they are poor; a 43% plurality say conditions are only fair. Positive views of the economy are about the same as in January (27%). But somewhat more describe the economy as poor than did so last month (31% now, 24% then) while the share saying it is only fair has ticked down (from 48% to 43%). Nonetheless, views of the economy remain much more positive than they were in January 2014, when just 16% rated the economy as excellent or good. Looking ahead, 27% say they expect economic conditions to be better in a year compared with 20% who think they will be worse; 52% say they will be about the same as they are now. The share saying they expect conditions to improve has declined slightly from January (from 31% to 27%). There continue to be partisan divides in views of economic conditions. Among Democrats, 36% rate conditions as excellent or good compared with just 14% of Republicans. Democrats also are more optimistic about the future: 37% say the economy will be better in a year, while just 9% think it will be worse. Among Republicans, more think economic conditions will be worse in a year (28%) than better (15%). Seven-in-ten Democrats (70%) and 65% of independents regard the economic system as unfair. Republicans are divided: 49% say the system unfairly favors powerful interests, while 47% say it is fair to most Americans. Majorities across income categories view the system as unfair. As with opinions about the fairness of the economic system, views about whether hard work can lead to success differ more along partisan than income lines. Overall, 55% of Democrats say most people can get ahead through hard work compared with larger majorities of independents (63%) and Republicans (78%). Across income levels, similarly large majorities say most people who want to get ahead can make it if they’re willing to work hard. Opinions on the impact of government assistance to the poor are even more partisan than views on the fairness of the economic system and hard work and achievement. Overall, the public is split with 44% saying government aid to the poor “does more harm than good by making people too dependent on government assistance,” while about as many (49%) say it does “more good than harm because people can’t get out of poverty until their basic needs are met.” Republicans, by 71% to 24%, say government aid to the poor does more harm than good. Democrats take the opposite view and by a nearly identical margin (74% to 21%), say aid to the poor does more good than harm. A majority of those with family incomes of less than $30,000 a year (58%) say government aid to the poor does more good than harm. People in higher income groups are more divided. Views on these three questions are largely unchanged from last June. As the Pew Research Center’s Political Typology report noted, there are deep divisions between, as well as within, the broader party coalitions on several of these measures. Within both parties, there are notable divisions by income level in core economic beliefs. Among Democrats, those with family incomes of $75,000 or more are more likely than those with low incomes (less than $30,000) to say the economic system is unfair, that hard work is no guarantee of success and that government aid to the poor does more good than harm. On the value of hard work, for instance, 62% of Democratic and Democratic-leaning independents with incomes of less than $30,000 say most people can get ahead if they work hard; 57% of those with incomes of $30,000-$74,999 agree. But those with incomes of $75,000 or more are divided: 48% say hard work leads to success, while 51% say it is no guarantee of success for most people. Ideology is a factor in these opinions. For example, 57% of liberal Democrats say hard work is no guarantee of success for most people. By contrast, among conservative and moderate Democrats, 64% say most people who work hard can get ahead. Democrats with higher incomes are more likely to describe their political views as liberal than are those with middle or lower incomes. Among Republicans, by far the biggest differences between income groups are over aid to the poor: 80% of Republicans and Republican leaners with incomes of $75,000 or more say government aid to the poor does more harm than good, as do 71% of those with incomes of $30,000-$74,999. But among Republicans with incomes of less than $30,000, 45% see government assistance to the poor in negative terms, while 48% say it does more good than harm. 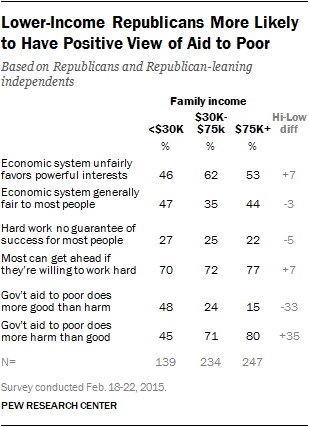 Majorities of Republicans across income groups say most people can get ahead with hard work. Republicans with incomes of $30,000-$74,999 are somewhat more likely than those with higher or lower incomes to say that the economic system is unfair. Amid debate over which policies would do the most to improve the lives of the middle class, large percentages of Americans identify with the term – either completely or with some qualification. When asked to choose from five names for the social classes, 47% say they are middle class, 29% say they are lower-middle class, while 11% say they are upper-middle class. Just 1% say they belong in the upper class. Somewhat more (10%) place themselves at the bottom of the scale and say they are lower class. Views on this question have changed little over the past year. 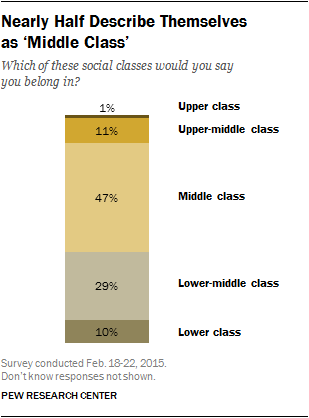 In January 2014, 44% described themselves as middle class, 28% as lower-middle class and 13% as upper-middle class. Those with family incomes of $100,000 a year or more are among the most likely to place themselves at the top of the social class ladder: 40% say they are either upper-middle or upper class. However, 51% say they belong in the middle class and 8% say they are lower-middle class. Among those with incomes of $75,000-$99,999 and $50,000-$74,999, majorities describe themselves as middle class. Those with smaller incomes are more likely to say they are lower-middle class or lower class. There also are racial and ethnic differences in how people describe their social class; about half of blacks (51%) and Hispanics (48%) say they are either lower-middle class or lower class, compared with 35% of whites.